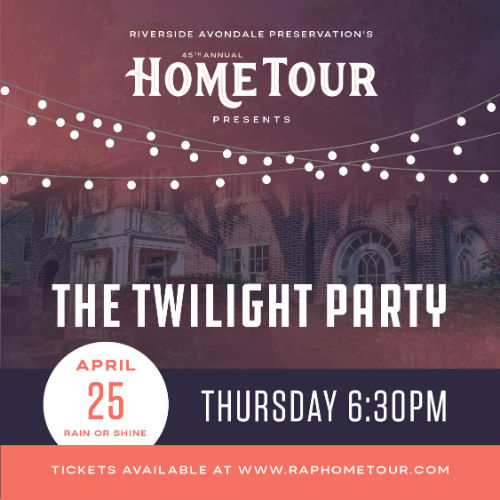 This year’s Riverside Avondale Spring Home Tour kicks off with a special Twilight Party, an outdoor evening celebration at abeautiful home with a lighted patio and backyard on Richmond Street in Avondale. The party has been a popular tradition of the tour for the past six years, held the Thursday prior to the Tour weekend. This year, the party is at a home is not on the regular tour, so it is no longer a “preview” but a one-time event. The outdoor concept was inspired by the experience of last year’s “twilight” home hosted by Phil Stantial. The music is by Darren Ronan and scrumptious food provided by Biscotti’s. There are so many interesting people living in our historic district, we want to feature one of them during the Party. Dr. James P. Delgado, an Avondale resident, is an internationally known archaeologist, historian, journalist, and educator. Dr. Delgado’s work fits well with the historic preservation focus of the weekend. Dr. Delgado’s television experience spans more than 150 documentaries for ABC, National Geographic, Discovery, History, and many other networks. He was the host for all six seasons of National Geographic International’s “The Sea Hunters,” which focused on the discovery, examination and stories behind some of history’s most amazing shipwrecks around the world. We are honored to have Dr. Delgado speak during our Twilight Party.